A SIMPLE CHART OF THE PRESENT SIMPLE CONTENTS. STUDENTS CAN KEEP IT OR STICK IT ON THEIR NOTEBOOKS AS A DRAWING TO REMEMBER THE GRAMMAR. ANY VERB CAN BE USED. This downloadable printable is intended for elementary school students at Pre-intermediate (A2) level. 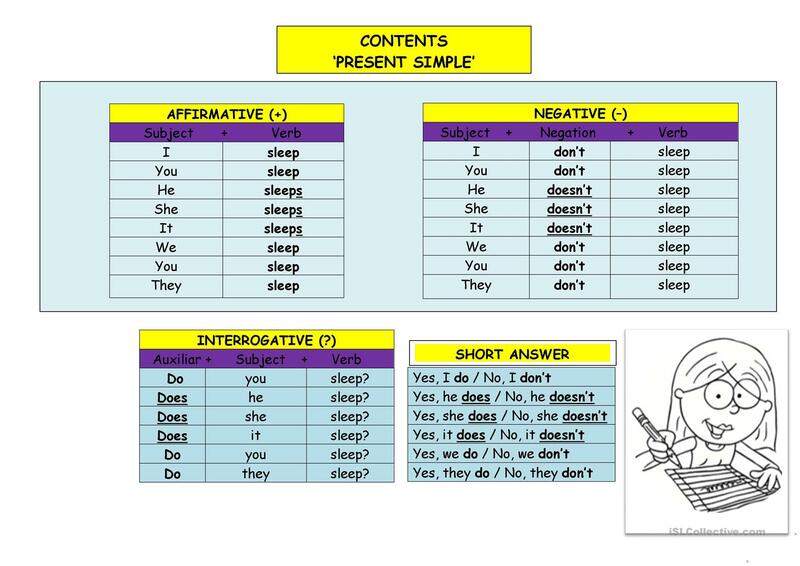 It is valuable for revising Present simple tense: S for third person singular verbs in English, and is useful for working on your groups' Writing skills. It features the theme of Actions. Marths89 is from/lives in Spain and has been a member of iSLCollective since 2015-03-20 19:23:48. Marths89 last logged in on 2015-05-07 22:02:38, and has shared 1 resources on iSLCollective so far.